My favorite things to do in the creek were talking to my imaginary friends, building dams, and breaking rocks. In fact, I became very adept at breaking all sorts and shapes of rocks. I would break them into the largest pieces possible so I could see what cool shapes, colors, and sparkly objects were inside. As I learned much later in my life, by breaking rocks and looking inside, my deepest needs and hopes were to find something beautiful, sparkly and treasured inside my own stony heart—which had become as hardened and compartmentalized as the flinty-hard stone pictured here. When I was about 11 years old, I carefully positioned a hard, deep reddish-maroon colored rock on top of a larger “anvil rock” and broke it perfectly in half. To my absolute amazement, one half of the rock revealed the miraculous shape seen in the very same rock pictured here [see inset image]! I immediately ran home and showed it to my family. We all agreed that the nearly free-standing shape inside the perfectly rectangular cavern in the stone was a “window”. Yes, a window. For many years I kept the rock in a safe place and never paid much more attention to it. 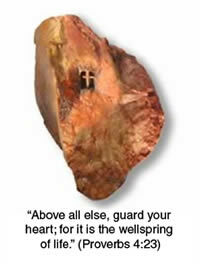 At the age of thirty-one—after I had become a Christian—I took the rock out of its storage place. At that moment I immediately saw the shape as it really was—a cross. Over the years, I had completely forgotten that we ever called the shape in the stone a window. How could something be so obvious at one point in my life, and be so completely different at another? I believe there is only one answer: I was different. I had radically changed. And God had a special and marvelous plan for my story… to impact other’s story with the same Good News and mercies I had received from God. What do you see in the stone? A window into your heart? Or the cross of Christ within? Perhaps your answer is both. Or neither… The answer might depend on the nature of your own story and your present heart and life circumstances. Today I believe in the core of my being that God gave me a very special and miraculous gift that day as I played in the creek. God gave me the gift of a window into my heart that revealed something very special inside: a lovable, unspeakably valuable, and treasured little boy of inestimable worth. He also gave me the unmerited and grace-full gift of the cross in my heart as it would appear in my adult life after my heart had been broken apart, redeemed, and born-again by Jesus Christ—and some of His loving follower-friends of mine. God gave me the astounding gift of redeeming the pain and suffering of my past and providentially taking this opportunity to tell you this story of my wounded, hardened and redeemed heart so that it might be a story of remembering, hope, exhortation, and encouragement to all the people God providentially places in my life. These dynamics transform a stony heart into a heart of flesh so that we might have a heart more like the heart of Jesus Christ. Are there people in your life whom you love enough to help them remember the nature and value of their own personal story, the true nature of their heart? How well do you know your own personal story and how God is using the most intimate details of your story to ignite His purpose and passion for your life and the lives of others? Offered in deep respect and whole- and hopeful-hearted love and truth, John O. Dozier, Jr.